AGP supplies a wide range of Vented Screws and components, if you don't find it here on these pages, please give us a call and we can manufacture it for you. The use of a vented screws or venting screws in vacuum environments is critical. A blind tapped hole creates a gas pocket that shows itself as a virtual leak, causing unwanted downtime. Accu-Glass Products, Inc. supplies a wide range of vented screws and components, if you don't find it here on these pages, please give us a call and we can manufacture it for you. The use of vented screws or venting screws in vacuum environments is critical. A blind tapped hole creates a gas pocket that shows itself as a virtual leak, causing unwanted downtime. The use of a vent or vented screws that has a center-bore provides an outgas path. 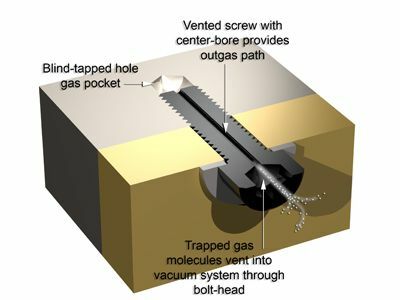 Trapped gas molecules vent into the vacuum system through the vented screw bolt-head and out of the system. We currently offer, Socket Head Cap Vented Screws, Phillips Pan Head Vented Screws, Phillips Flat Head Vented Screws, Hexagonal Head Vented Screws, Socket Set Vented Screws, Vented Flat Washers, and Vented Slit Lock Washers. All Vented Screws are made with vacuum compatible vacuum 18-8 Stainless Steel. Custom Vented Screws and other components are available on request.